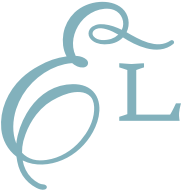 Creative suggestions, requests, and design ideas come pouring into our inboxes everyday! 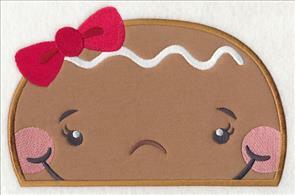 Come take a look at the newest Request-fest, featuring all new designs inspired by you! 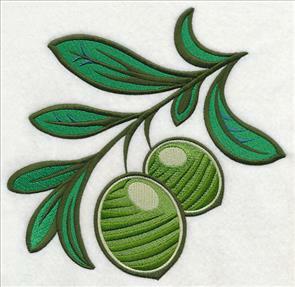 Embroiderers are some of the best when it comes to thinking up new design ideas, and this week is no exception. The variety is astounding! 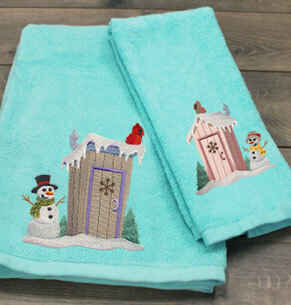 New winter outhouses are perfect on a pair of hand towels, while inky moose and floral designs are one-color wonders on shirts, linens, and more. 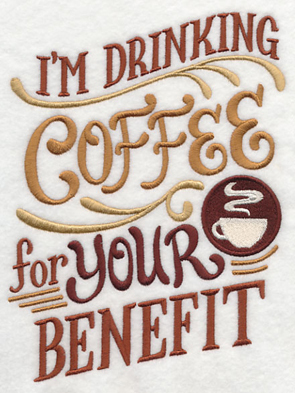 Designs featuring coffee, olives, and cupcakes are terrific when stitching for the kitchen, plus new on-the-edge, applique, and in-the-hoop designs are sure to spark your creativity! 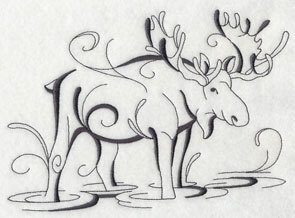 Scroll down the page to see the new designs. fabulous addition to bath decor! 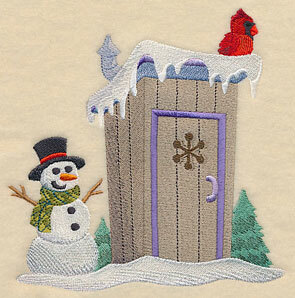 "How about a winter, not a Christmas outhouse?" 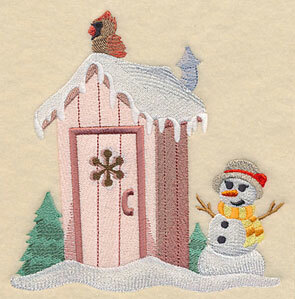 Judy was looking for a his-and-hers alternative to the outhouse designs on the site, and we loved the idea! 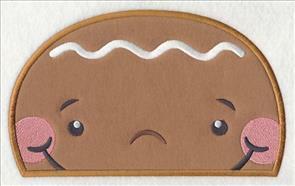 These adorable designs are the perfect additions to towels for your bathroom. 5.85" x 5.96" and 4.85" x 4.95" and 3.59" x 3.84"
Patti really loves coffee quote designs, and was looking for one that said "I'm drinking coffee for your benefit." 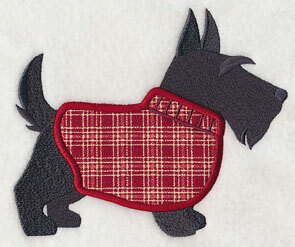 It's a cozy way to warm up mug rugs, wall hangings, aprons, kitchen towels, and more. to this cozy coffee saying. 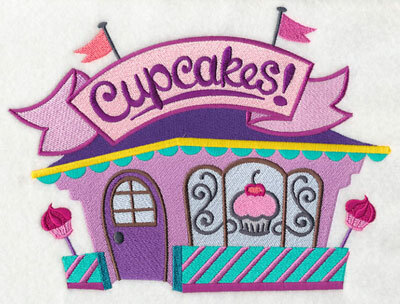 Viebschen wrote in asking for a few cupcake bakery, or cupcakery, designs. 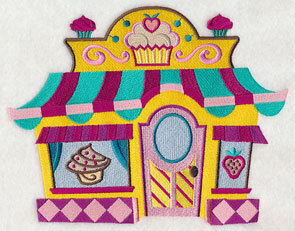 She knows lots of moms who have to make cupcakes for school, and thought a few storefronts would be sweet additions to purses or cupcake totes. 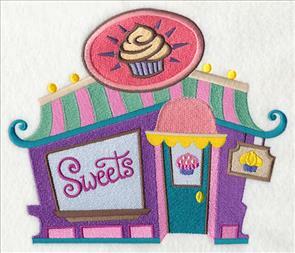 9.12" x 6.90" and 7.80" x 5.91" and 7.09" x 5.37" and 6.43" x 4.87"
These cupcake bakeries are bright and colorful, and tasty embroidery for aprons, towels, tote bags, and other projects, too! Pick your favorite, or stitch them all! 8.15" x 6.90" and 7.47" x 6.33"
8.77" x 6.87" and 7.76" x 6.08"
6.92" x 5.42" and 6.18" x 4.84"
Bea lives in Tuscany and requested a olive design to mark the beginning of the olive harvest. 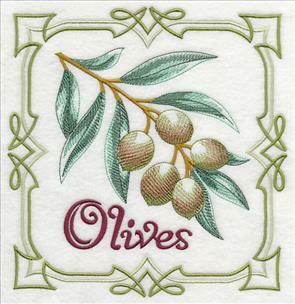 Three different olive motifs have been created -- an embellished square, a realistic sketch, and a stylized version. 7.57" x 7.81" and 6.90" x 7.12"
5.84" x 6.02" and 4.84" x 4.99"
6.90" x 7.59" and 5.84" x 6.43"
4.84" x 5.33" and 3.50" x 3.86"
Kitchen decor is a delightful way to showcase these olive designs! 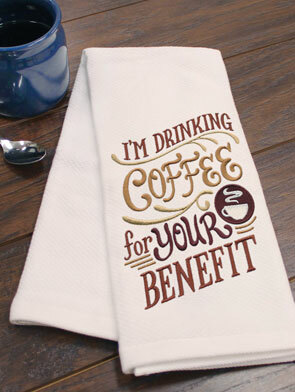 Stitch them on aprons, kitchen towels, wall hangings, and more. 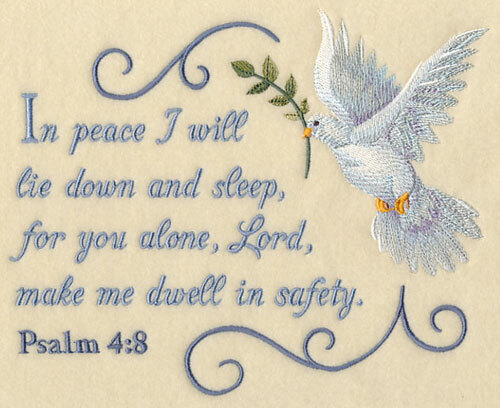 7.80" x 7.52" and 7.15" x 6.90" and 6.09" x 5.87" and 5.05" x 4.87" and 3.87" x 3.74"
Hollins thought that Psalm 4:8 -- "In peace I will lie down and sleep, for you alone, Lord, make me dwell in safety" -- would be a lovely addition to wall hangings, blankets, or pillows. Thanks for the suggestion, Hollins! 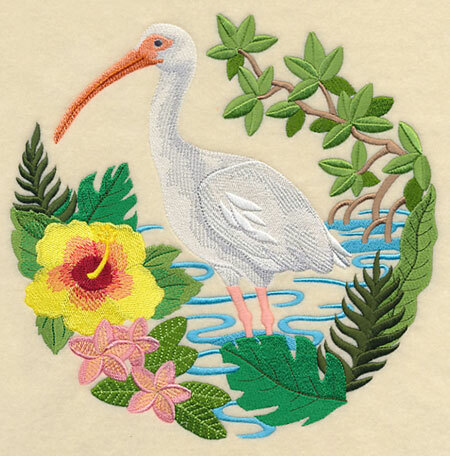 8.51" x 6.90" and 7.24" x 5.86" and 6.44" x 4.88"
Debra writes "I have recently moved to Florida and my first flock of birds in my yard were the White Ibis. They are so beautiful." Here, one of these majestic birds is surrounded by lush greenery and blooming flowers. 8.60" x 8.56" and 7.80" x 7.77" and 6.90" x 6.87" and 5.84" x 5.82" and 4.84" x 4.82"
Helen is a big fan of the Intricate Ink designs on the website and wanted to see a moose version. Good thinking, Helen! These inky designs are quick-stitching additions to low nap towels, shirts, and tote bags. 7.76" x 5.86" and 6.44" x 4.86" and 3.85" x 2.91"
The smooth, neutral fabric on this pillow makes it the perfect place to stitch these new inky designs. 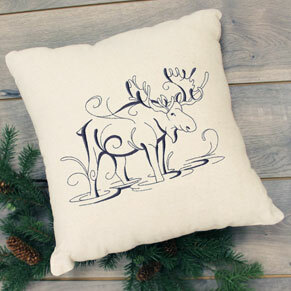 An ethereal moose design is a gorgeous way to update table linens, such as placemats or tablecloths, as well as pillowcases, blankets, and towels. 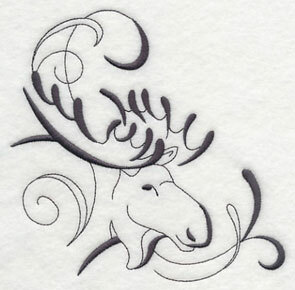 9.40" x 3.05" and 6.00" x 2.10" and 3.84" x 1.26"
A inky moose corner and accessory are terrific complements to the designs above, and are also great options to stitch singly, too. 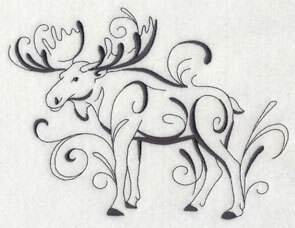 Let one of these moose designs adorn your next project, or stitch them all! Pick your favorites by clicking the links above, or get them all in a design pack! 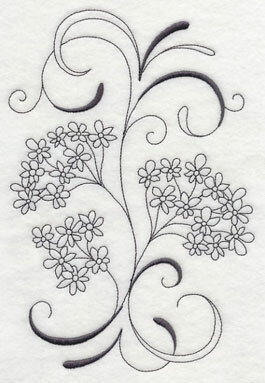 Maria was hoping that we could create a few Queen Anne's Lace designs also in the inky style. 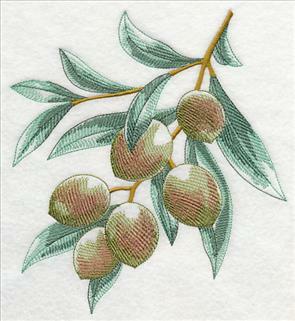 She is planning to stitch them in white thread on a white duvet cover -- beautiful idea, Maria! 5.85" x 8.43" and 4.76" x 6.86" and 2.67" x 3.86"
Along with the two Queen Anne's Lace designs above, a border design has also been created. 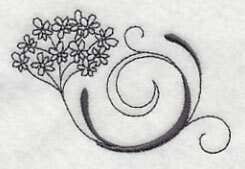 It's a fabulous way to stitch the floral motif on bed linens, quilts, and more. 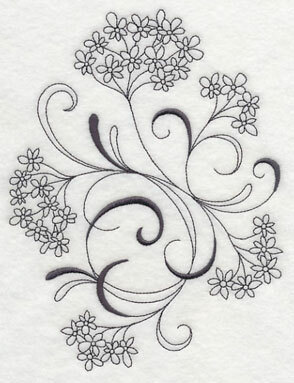 Finish this collection of inky Queen Anne's Lace with a corner and accessory design. 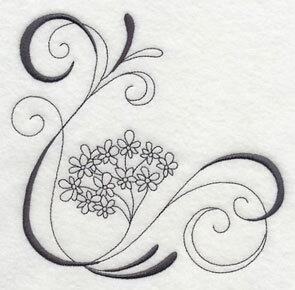 The light stitches and intricate flourishes add a touch of whimsy and elegance to the flowers. Stitch these beautiful, intricate ink designs on shirts, linens, totes, and more. Order the designs individually by clicking the links above, or get the design pack. 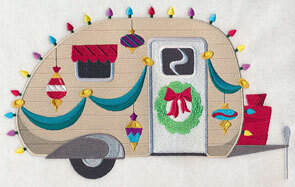 Katrina was looking for an older travel trailer design that's all dressed up for Christmas! 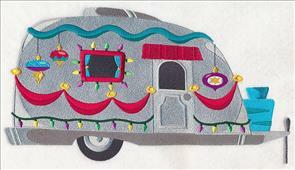 These airstream and canned ham trailers are all decked out for the holidays with lights, ribbons, ornaments, and more. 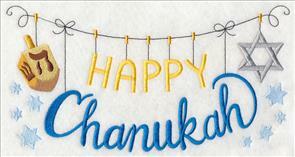 11.71" x 6.33" and 9.39" x 5.08"
11.25" x 6.83" and 9.37" x 5.69"
7.80" x 4.73" and 6.85" x 4.16"
Embroiders loved the new in-the-hoop witch's boots, and were clamoring for holiday versions, too! 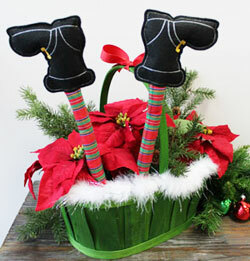 Here a pair of Santa Claus boots are an adorable addition to your holiday decorating. Get the step-by-step instructions for these Santa boots here. 5.24" x 4.85 and 3.88" x 3.59"
Show off your Santa Claus boots sticking out of a holiday centerpiece. Or, stitch a pair of elf's boots instead! The festive in-the-hoop design adds a holly-jolly look when sticking out from under the tree skirt, off of a mantelpiece, or peeking from under a door. 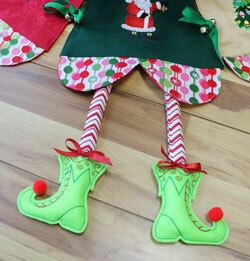 Get the step-by-step instructions for these elf boots here. 4.97" x 4.85" and 3.88" x 3.79"
Fabric glue adds ribbon and pom-poms to these boots for even more flair. Linda's grandkids love the On-the-Edge designs on towels and pillowcases, and she wrote in requesting a pair of peeking gingerbread designs, too. 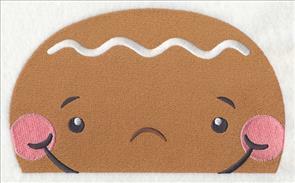 These so-sweet cookie designs are adorable additions to Christmas projects, such as quilts, blankets, and more. 8.51" x 5.59" and 6.85" x 4.50" and 3.90" x 2.55"
The peeking gingerbread designs come in a girl and boy version, as well as stitch-filled and applique. 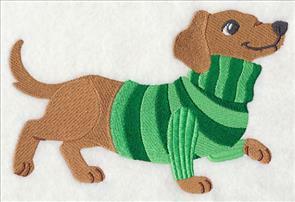 Learn how to embroider the stitch-filled version here, and the applique version here. 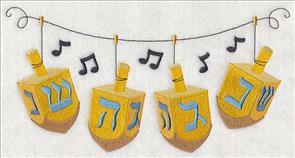 8.52" x 5.18" and 6.87" x 4.18" and 3.90" x 2.39"
Roz was hoping that we would create some Chanukah designs to add to our growing collection of clotheslines. We thought the idea was terrific -- thanks, Roz! 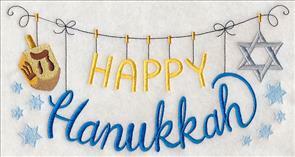 9.40" x 4.88" and 7.79" x 4.04" and 6.84" x 3.55"
Along with the menorah and dreidel clotheslines above, there are also "Happy Hanukkah" and "Happy Chanukah" designs. 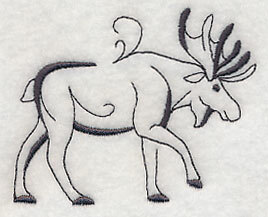 Stitch them on pillows, tote bags, sweatshirts, and t-shirts. 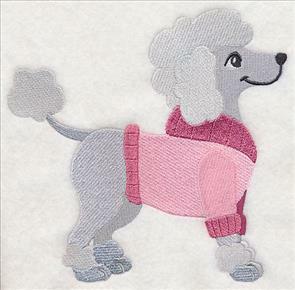 9.40" x 4.93" and 7.80" x 4.09" and 6.85" x 3.59"
Amanda thought applique dogs in sweaters would be adorable additions to her embroidery collection, and we liked the idea so much we created stitch-filled versions, too! 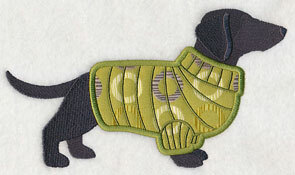 The dogs come in three different breeds -- a dachshund, Scottie, and poodle. 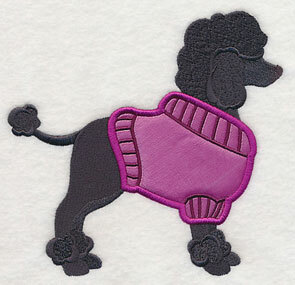 Click here to get a free tutorial on classic applique, or here to watch the video! 7.37" x 4.89" and 6.47" x 4.29"
7.81" x 4.43" and 7.15" x 4.06"
6.29" x 3.57" and 3.87" x 2.20"
We mimicked the patterns of the stitch-filled pups in the fabric choice for the applique versions, but you can choose any style you prefer! 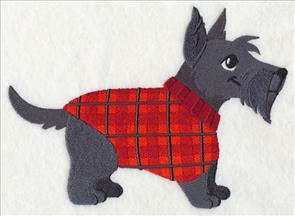 Plaids, polka dots, and other patterns add a fun interest point to this embroidery. 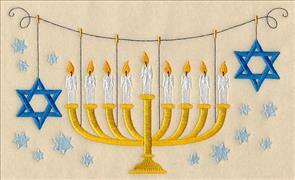 7.80" x 5.69" and 6.85" x 5.00"
6.11" x 5.12" and 5.45" x 4.56"
4.78" x 4.01" and 2.94" x 2.46"
The stitch-filled designs are a bit more detailed and colorful, while the applique version feature silhouettes of each dog breed. Stitch your favorite, pick out a pair, or use them all on your next project. 6.88" x 6.67" and 6.04" x 5.86"
6.39" x 6.01" and 5.88" x 5.53"
5.14" x 4.84" and 3.02" x 2.83"